Meet Kerstin Cobb: Designer, Remodeler and Owner of A King’s Kitchen and one of our Resources That ROCK!. Born and raised in Germany, she came to the States in 2014 to Savannah, Georgia and has lived all over the country, moving with her Military husband. In 2017, she opened up A Kings Kitchen. While her Degree in Kitchen & Bath Design is certainly enough to qualify her for any project, she has a unique skill set and experience in design, style and trends, having lived all over the US and Europe, that sets her apart from the rest and adds a value that can’t be taught. To help people truly understand the materials, and guide them to the right materials that fit their needs. I naturally love to inform, learn and inspire others about the Cabinet and Countertop industry. There is such beauty in the materials and the craftsmanship. The fact that my knowledge and experience can save others from bad decisions and tons of money lot during the remodeling process, gives me extreme fulfillment. I ask questions and give advice based on treating every project as if it was my own. This is how I get to meet strangers, and turn them into friends. We know this first hand! We met Kerstin at Ignite U, an awesome networking group, where we quickly learned of her reputation from other professionals. We immediately thought she should be a preferred vendor for The Team That ROCKS! When the opportunity came up that Tory was remodeling his own kitchen, he knew just who to call! Kerstin was patient with us in the stressful process of deciding what we wanted, putting our vision into design and selecting colors and finishes. She helped us visualize, gave us options and made it all easy. The best part… After we chose our counter tops, she called us in to look at two others that were extremely similar, but less money. She could have let us roll with it, but instead she saved us over $2,000. She truly cared about our experience, the outcome and getting us the best deal. Kerstin has taken care of many of our clients from just a consultation, to new counters and hardware, to complete redesigns and remodels. We love her energy, passion, knowledge and quality of work. 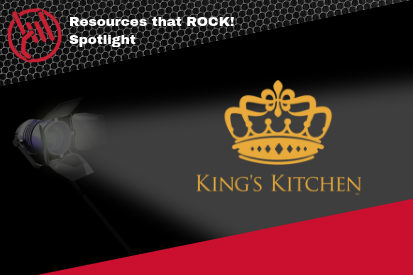 She treats her clients like royalty, hence the name… A KINGS Kitchen. And as we treat our clients as royalty as well, we proudly refer our Clients that ROCK! to A Kings Kitchen. Check out this video with Kerstin in her showroom!